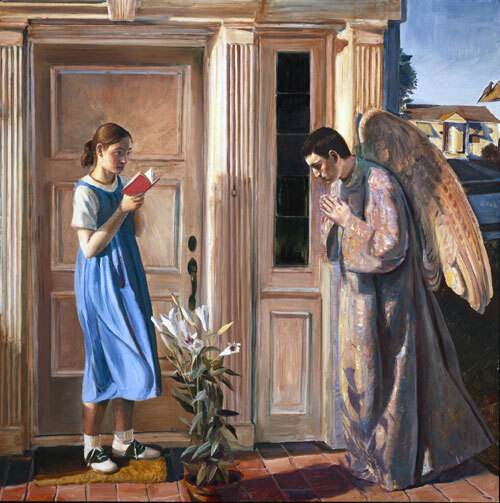 The Feast of the Annunciation marks the visit of the angel Gabriel to the Virgin Mary, during which he told her that she would be the mother of Jesus. It is celebrated on 25 March each year. It is a principal Marian feast. 26 In the sixth month the angel Gabriel was sent by God to a town in Galilee called Nazareth, 27 to a virgin engaged to a man whose name was Joseph, of the house of David. The virgin’s name was Mary. 28 And he came to her and said, ‘Greetings, favoured one! The Lord is with you.’ 29 But she was much perplexed by his words and pondered what sort of greeting this might be. 30 The angel said to her, ‘Do not be afraid, Mary, for you have found favour with God. 31 And now, you will conceive in your womb and bear a son, and you will name him Jesus. 32 He will be great, and will be called the Son of the Most High, and the Lord God will give to him the throne of his ancestor David. 33 He will reign over the house of Jacob for ever, and of his kingdom there will be no end.’ 34 Mary said to the angel, ‘How can this be, since I am a virgin?’ 35 The angel said to her, ‘The Holy Spirit will come upon you, and the power of the Most High will overshadow you; therefore the child to be born will be holy; he will be called Son of God. 36 And now, your relative Elizabeth in her old age has also conceived a son; and this is the sixth month for her who was said to be barren. 37 For nothing will be impossible with God.’ 38 Then Mary said, ‘Here am I, the servant of the Lord; let it be with me according to your word.’ Then the angel departed from her. 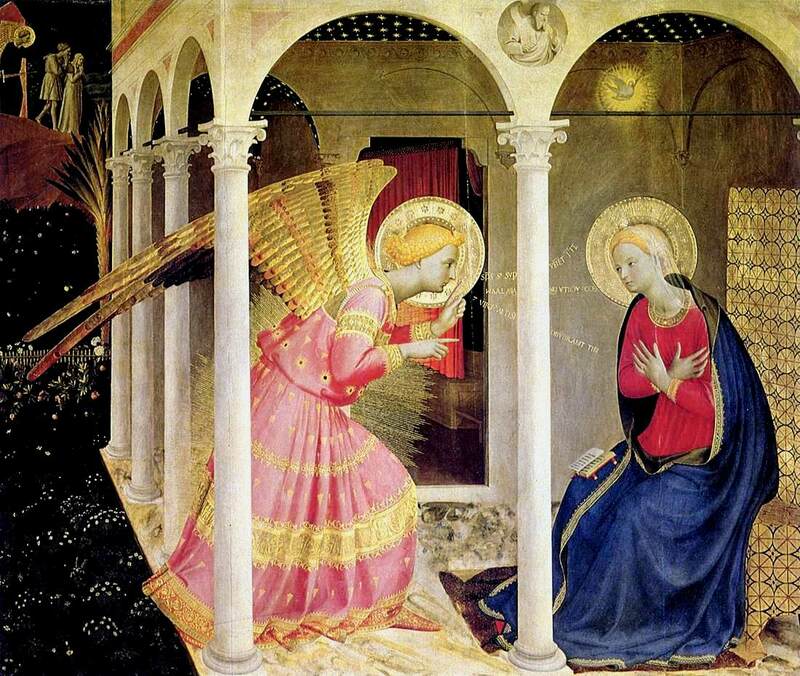 Here is the Annunciation hymn “The Angel Gabriel” sung by King’s College choir, Cambridge. It is usually sung at Christmas but, in a liturgical sense, belongs here. The celebration of the feast of the Annunciation goes back to the fourth or fifth century. The first certain mentions of the feast are in a canon, of the Council of Toledo (656), where it is described as celebrated throughout the church, and another of the Council of Constantinople “in Trullo” (692), forbidding the celebration of any festivals during Lent, excepting the Lord’s Day (Sunday) and the Feast of the Annunciation. A Synod of Worcester, England (1240), forbade all servile work on this feast day. In the Catholic Church, Anglican, and Lutheran liturgical calendars, the feast is moved if necessary to prevent it from falling during Holy Week or on a Sunday. To avoid a Sunday before Holy Week, the next day (March 26) is observed instead. In years such as 2005 when March 25 fell during Holy Week, the Annunciation was moved to the Monday after the Octave of Easter, which is the Sunday after Easter. The Eastern churches (Eastern Orthodox, Oriental and Eastern Catholic) do not move the feast of the Annunciation under any circumstance. They have special combined liturgies for those years when the Annunciation coincides with another feast. In these churches, even on Good Friday a Divine Liturgy is celebrated when it coincides with the Annunciation. 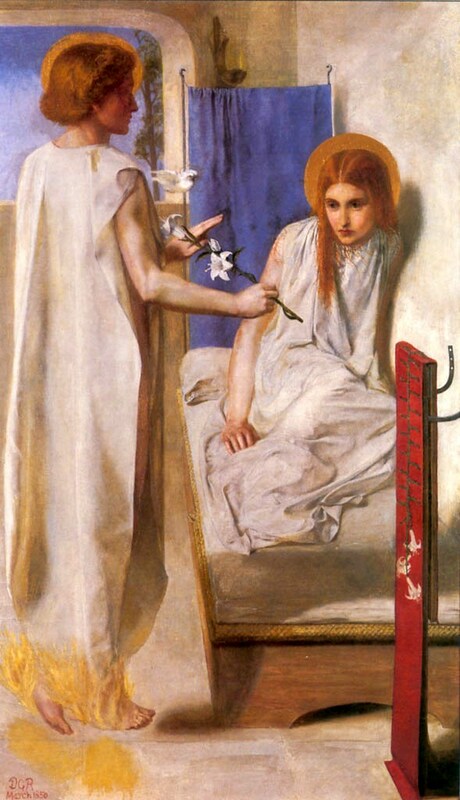 The date is close to the (northern) vernal equinox, as Christmas is to the winter solstice; because of this the Annunciation and Christmas were two of the four quarter days in medieval and early modern England, which marked the divisions of the fiscal year (the other two were Midsummer Day, or the Nativity of St. John the Baptist—June 24—and Michaelmas, the feast day of St. Michael, on September 29). When the calendar system of Anno Domini was first introduced by Dionysius Exiguus in 525, he assigned the beginning of the new year to March 25, since according to Catholic theology, the era of grace began with the Incarnation of Christ. In the western liturgical year, Lady Day is the traditional name of the Feast of the Annunciation of the Blessed Virgin in some English-speaking countries. Because Lady Day is one of the four traditional English quarter days it has a secular function as well as a liturgical one. As such Lady Day never moves like its liturgical counterparts. The “Lady” is the Virgin Mary, of course. The term derives from Middle English, many of whose nouns had no genitive inflections. In England, Lady Day was New Year’s Day up to 1752 when, following the move from the Julian calendar to the Gregorian calendar, 1 January became the start of the year. A vestige of this remains in the United Kingdom’s tax year, which starts on 6 April, that is, Lady Day adjusted for the lost days of the calendar change (until this change, Lady Day had been used as the start of the legal year). This should be distinguished from the liturgical and historical year. It appears that in England and Wales, from at least the late 14th century, the historical New Year’s Day was celebrated on 1 January as part of Yule. As a year-end and quarter day that conveniently did not fall within or between the seasons for ploughing and harvesting, Lady Day was a traditional day on which year-long contracts between landowners and tenant farmers would begin and end in England and nearby lands (although there were regional variations). Farmers’ time of “entry” into new farms and on to new fields was often this day. As a result, farming families who were changing farms would travel from the old farm to the new one on Lady Day. 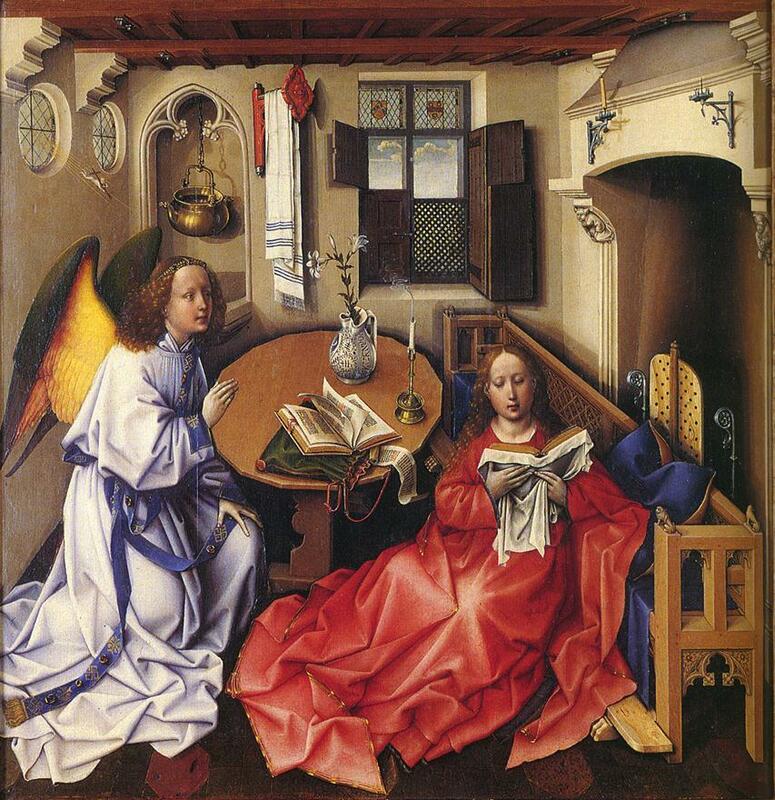 After the calendar change, “Old Lady Day” (6 April), the former date of the Annunciation, largely assumed this role. The date is significant in some of the works of Thomas Hardy, e.g., Tess of the d’Urbervilles and Far from the Madding Crowd. The logic of using Lady Day as the start of the year is that it roughly coincides with the equinox; many ancient cultures still use this period as the start of the new year, Iran for example. 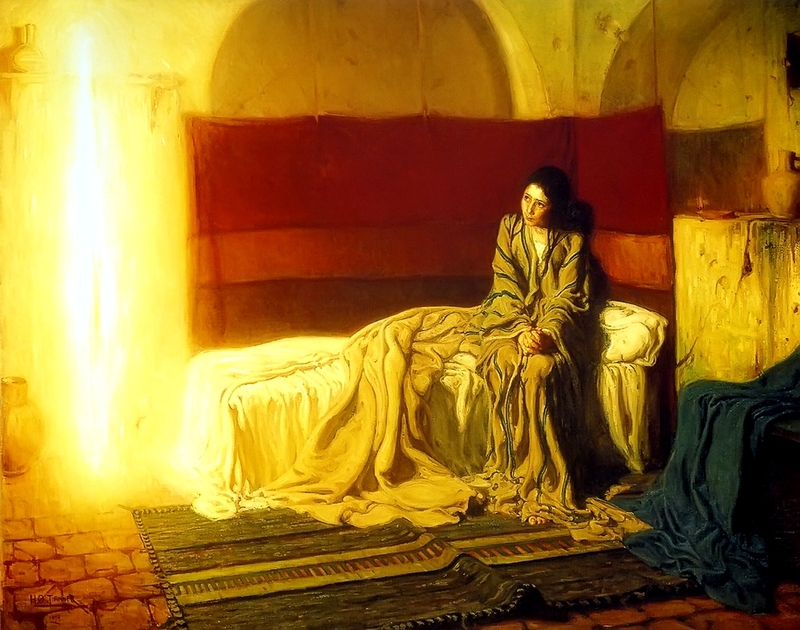 In some traditions the A.D. years are counted from the moment of the Annunciation, which is deemed by the church to be the moment of the conception of Jesus, and as such the moment the “word became flesh.” Thus, theologically speaking, the Annunciation supersedes Christmas as the point of Christ’s arrival on earth. 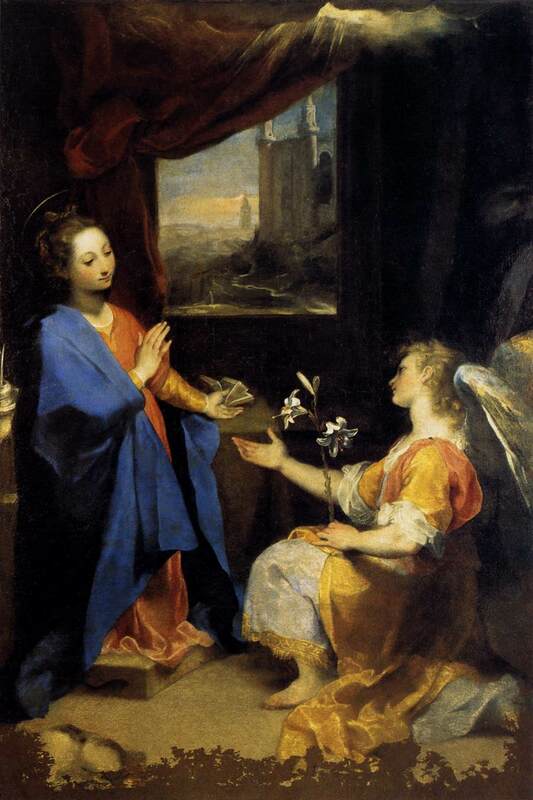 The Annunciation has been one of the most frequent subjects of Christian art. Depictions of the Annunciation go back to early Christianity, with the Priscilla catacomb including the oldest known fresco of the Annunciation, dating to the 4th century. It has been a favorite artistic subject in both the Christian East and as Roman Catholic Marian art, particularly during the Middle Ages and Renaissance, and figures in the repertoire of almost all of the great masters. The figures of the Virgin Mary and the angel Gabriel, being emblematic of purity and grace, were favorite subjects of Roman Catholic Marian art, where the scene is also used to represent the perpetual virginity of Mary via the announcement by the angel Gabriel that Mary would conceive a child to be born the Son of God. Works on the subject have been created by artists such as Sandro Botticelli, Leonardo da Vinci, Caravaggio, Duccio, Jan van Eyck, and Murillo among others. The mosaics of Pietro Cavallini in Santa Maria in Trastevere in Rome (1291), the frescos of Giotto in the Scrovegni Chapel in Padua (1303), Domenico Ghirlandaio’s fresco at the church of Santa Maria Novella in Florence (1486), and Donatello’s gilded sculpture at the church of Santa Croce, Florence (1435) are famous examples. Here’s a small gallery of some of my favorites. There are so many traditional recipes associated with the feast of the Annunciation across Europe. Here is a sampling. In Swedish the word våffla (waffle) is attested since 1642 and derives from the German Waffel, but is also associated by folk etymology with Vår Fru (The Virgin Mary). Waffles are served in a large number of Swedish households on Våffeldagen, that is to say, on Waffle Day, or Virgin Mary Day. 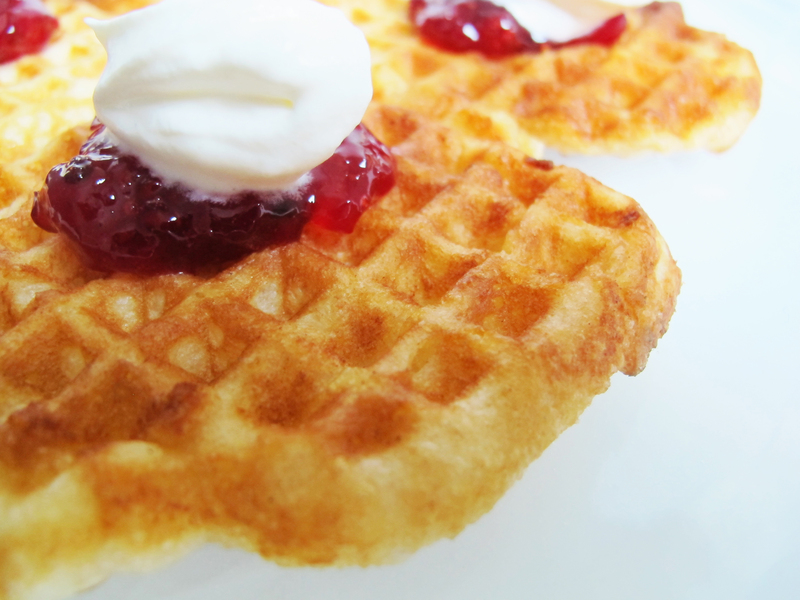 Here is a traditional recipe for Swedish waffles for the Annunciation. They are traditionally eaten with whipped cream and berry preserves, cloudberry or lingonberry. Whip the cream until stiff. Mix the flour, sugar, and salt in a bowl. Stir in the water to make a smooth batter. Fold the whipped cream into the batter. Stir in the melted butter. Heat the waffle iron. (If it is well seasoned, it will not need to be greased.) Fill the grid surface about two-thirds full of batter. Bake until golden brown. Place on a rack to keep crisp while you make the rest of the waffles. Serve with whipped cream and berry preserves. 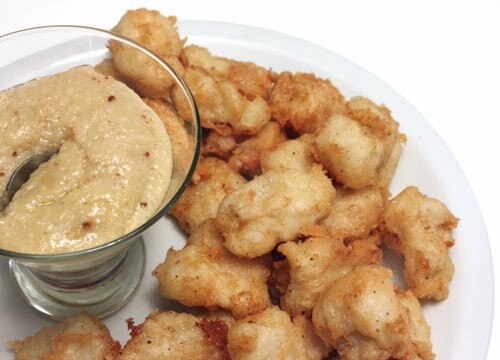 During the feast of the Annunciation, in most Greek homes they prepare Bakaliaros Tegantos kai Skordalia (Fried Salted Cod and Garlic Sauce) for the holiday meal. Cut the cod into 4-inch sections. Place in a glass or earthenware bowl, cover with cold water, and soak for 12 hours in the refrigerator. You may want to change the water 2 or 3 times during the soaking period. Drain and discard the water. Put the cod in a pot and cover with cold water. Bring to a boil, then remove from the heat and lift out the cod with a slotted spoon. Remove the bones and the skin, and carefully pat dry with paper towels. In a medium bowl, combine the flour, water and baking powder to make a thin batter. Dip the cod in the batter and shallow fry in hot oil (about 1/2 inch deep, in a medium-hot cast-iron skillet) on both sides, then lower heat to medium and cook until tender, turning once again. Serve hot. Place potatoes in a large saucepan; cover with water. Bring to a boil. Reduce heat, and simmer uncovered for 15 minutes. Add garlic to pan; cook 1 minute. Drain potato mixture in a colander over a bowl, reserving ½ cup of cooking liquid. Place potato mixture and reserved liquid in a food processor; add oil, lemon juice, and salt. Pulse until smooth. Serve warm or cover and chill overnight.